The cost for a temporary visitor hangtag is $6.87 per day. Using the weblink above, follow the link to “Temporary Visitor Parking Permit Purchase Instructions” for instructions for online purchase and printing of your visitor parking pass. Temporary Visitor parking permits and Departmental Visitor parking permits allow parking in the following University of Arkansas parking lots: Faculty/Staff (yellow signs), Resident Reserved (red signs), Student (green signs), Remote (orange signs) and parking meters (gray meters only) without paying the posted meter fee. Gold colored short-term, thirty minute limit parking meters may be used by visitor but require paying payment of meter fee. The temporary visitor parking permit DOES NOT allow parking in the following parking areas: Reserved (blue signs), twenty-four hour reserved spaces, parking garages, or the gold parking meters without paying the meter fee. See provided University of Arkansas Parking Map for the location of parking lots. The parking lot closest to the dormitory (Northwest Quad) where attendees are staying is Lot 37 which is Resident Reserved (red signs). This parking lot is located on the north side of the dormitory on the north side of campus at the intersection of Cleveland Street and Garland Avenue. The closest parking lot to the Reynolds Center (building code RCED), our venue for ICSB, is Lot 50 which is Resident Reserved (red signs). This parking lot is located on the west side of Yocum Hall (building code YOCM). Access this parking lot by driving west on Dickson Street then south on McIlroy Avenue or Center Street, north on Harmon Avenue, west on Fairview Street, north on McIlroy Avenue. See University of Arkansas Parking Map for more details. A visitor parking pass may also be obtained in person by visiting the Transit and Parking Department located at 155 Razorback Road, Fayetteville, AR 72701. Office hours are Monday-Friday, 7:00-17:00. Phone number: (479) 575-7275. In several places across campus, there are metered parking spots and metered parking is available in the parking garages. The parking garage closest to the Reynolds Center, the venue for ICSB, is the Harmon Avenue Parking Garage (building code HAPG). See University of Arkansas Parking Map for more details. The Harmon Avenue Garage is a gated facility with entry and exit controlled by an access card. Hourly parking is available and payment may be made at one of the pay stations located on levels one and six of the facility. Payment may be made by cash, coin, credit cards, or debit cards. The cost for parking is $1 per 38 minutes or $16.00 per day. Vehicles leaving the facility within 20 minutes of entering will not have to pay for parking. This is to allow the driver to conduct business at the Parking Office or the Parking Spot. A driver who exits more than 20 minutes from the entry time will pay the full rate for parking. Obtaining a Temporary Visitor Parking Permit will be cheaper than metered parking in the Harmon Avenue Garage, but a Temporary Visitor Parking Permit is NOT valid for use in the Harmon Avenue Garage. See instructions provided for obtaining a Temporary Visitor Parking Permit. For attendees staying at Staybridge Suites Fayetteville location, the University of Arkansas Razorback Transit system has a transit stop (Purple Route: Tyson Track Stop) to the north of the hotel at the intersection of DeBriyn Drive and W 15th Street. 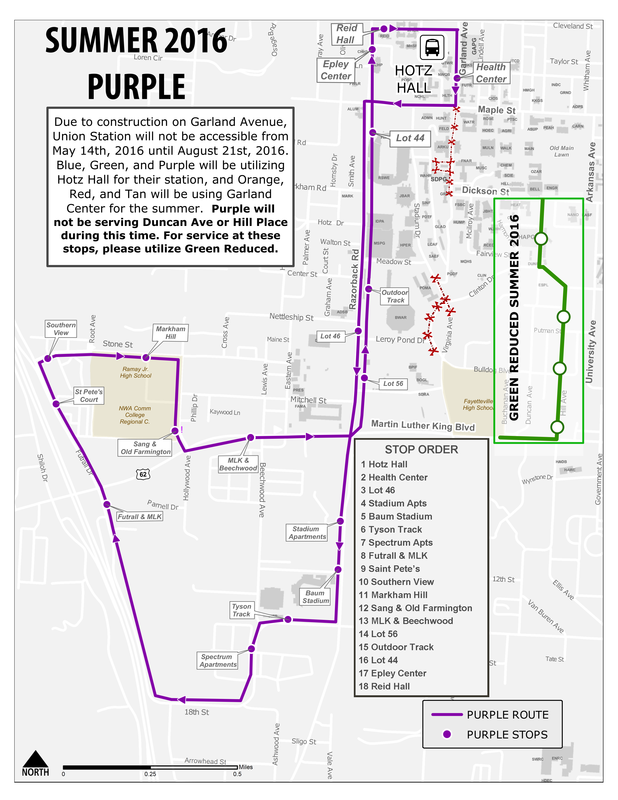 Take the Purple Route transit bus to the Health Center stop. From the Health Center stop, walk south/southeast to the Reynolds Center (Building code RCED), our venue space for ICSB. 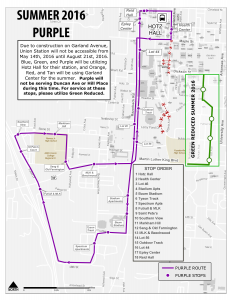 The Purple Route runs during the summer months, 7:00-17:30, Monday-Saturday. The last bus leaves Hotz Hall at 17:30. There is NO evening transit service and NO service on Sundays. Please plan accordingly as evening ICSB events will end later than 17:30. Parking on campus during ICSB events is an alternative option, and Temporary Visitor Parking Permits can be purchased following the instructions provided. Carpooling is also encouraged. For attendees with vehicles that are staying in dormitory housing, please follow the instructions to purchase a Temporary Visitor Parking Permit. You WILL be ticketed if you do not have a parking permit. 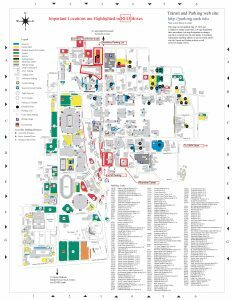 With a Temporary Visitor Parking Permit, you will be able to use Lot 37 which is Resident Reserved (red signs) and Faculty/Staff (yellow signs). Parking is free after 8pm on weekdays and the Faculty/Staff section (yellow signs) is free on Saturday/Sunday.